Check out the latest issue of BCAction’s newsletter, The Source. In this issue you’ll find important actions to take on breast cancer treatment and prevention issues, updates on our program work, and much more. Twenty years ago, Breast Cancer Action (BCAction) took a brave and unprecedented stand. In order to always put women’s health first, in 1998, BCAction became the first national breast cancer organization to adopt a policy explicitly prohibiting financial support from corporations, such as pharmaceutical companies and corporate polluters.This pioneering governance policy to refuse funding from organizations that profit from or contribute to the cancer epidemic, has come to define Breast Cancer Action and our unique role in the field. Read more. 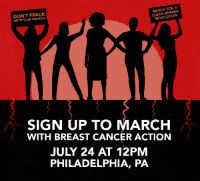 March with us to demand that our elected officials stop oil and gas industries from poisoning our water, our air and ultimately our health.On July 24th, thousands of people will flood the streets of Philadelphia to demand a break with fracking and other toxic processes that endanger our health. the time for action is now. Read more. 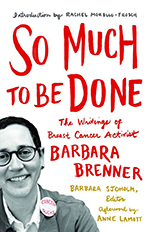 In her last post, written 5 days before her death in May 2013, Barbara wrote “This blog will be up for a while — and some ambitious person may turn it into a book.So Much To Be Done: The Writings of Breast Cancer Activist Barbara Brenner edited by Barbara Sjoholm was published by the University of Minnesota Press in May 2016. We are proud to share with you this excerpt from the Introduction and hope you will be moved to order a copy of your own. Read more. ← March with us 1 month from today!